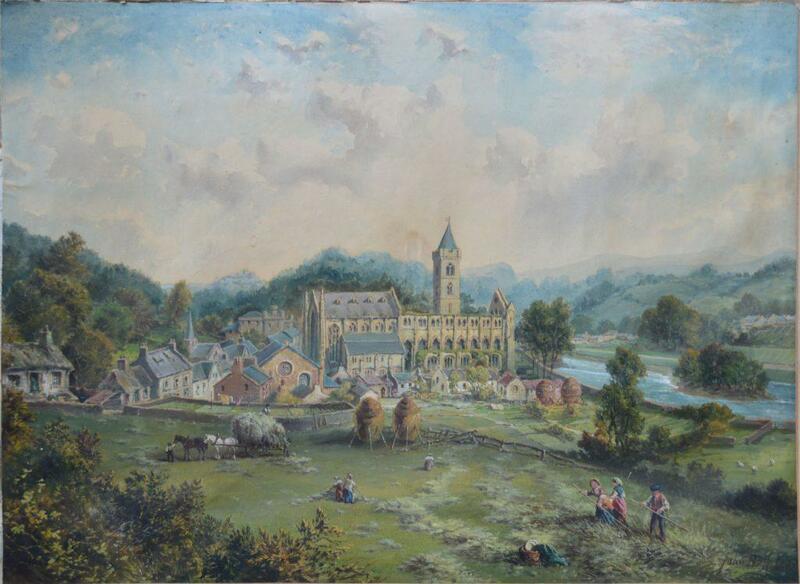 This watercolour by artist John Bell shows a rural Dunblane of 1887. It is a recent purchase for the Stirling Smith collections courtesy of Dr Robin Campbell and the Stirling Common Good Fund. Not much is known about the artist. There are some works by him in York Museum collections and a similar oil painting in the Dunblane Museum collection. The artist’s viewpoint is looking south. On the left is Braeport, and the castellated building to the left of the cathedral is the old jail and police office, demolished in 1963. Beyond the jail in the left middle distance is Stirling Castle. The River Allan is on the right. Dunblane Cathedral was left ruined by the Reformation of 1560. The east end of the Cathedral was restored in 1816 – 17 by the great Scottish architect James Gillespie Graham (1776 – 1855) who was born in Dunblane. The nave, or main body of the Cathedral, was restored by another great Scottish architect, Sir Robert Rowand Anderson in 1888- 1893. This was made possible only by funding from Janet Wallace of Glassingall, who insisted on matching money being raised and gave £19,000 herself. Otherwise, the Cathedral might still be a picturesque ruin today, like St. Andrews or Elgin Cathedrals.